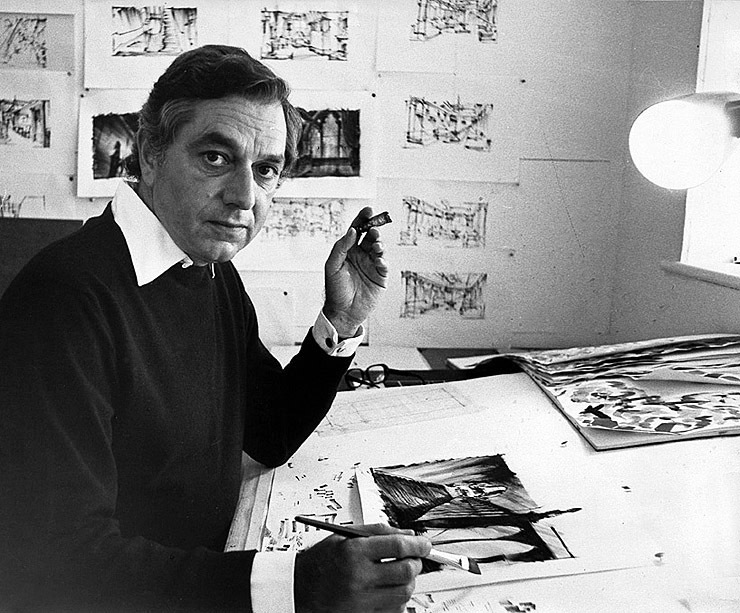 ABOVE: Ken Adam photographed at his studio working on designs for the The Seven-Per-Cent Solution (1976). I think the function of a film production designer is to create something which the audience has never seen. 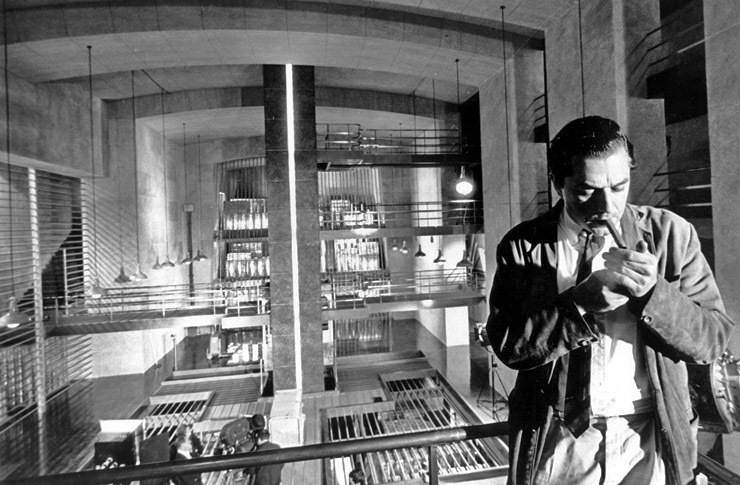 Ken Adam is regarded as one of the most important Production Designers of the 20th century. Adam was born in Berlin and his family fled Hitler’s regime in the 1930s. After serving in the RAF during the Second World War, he became involved in production design in 1948, getting his first Art Director credit on Around the World in Eighty Days (1956). Since then, Adam designed 75 films, creating the bold and revolutionary designs for seven James Bond films (Dr. No, Goldfinger, Thunderball, You Only Live Twice, Diamonds Are Forever, The Spy Who Loved Me and Moonraker) as well as the startling ‘War Room’ in Stanley Kubrick’s Dr. Strangelove (1963), described by Stephen Spielberg as ‘the best movie set ever built’. Adam was the first production designer to be knighted in 2003. He was a brilliant visualiser of worlds we will never be able to visit ourselves - the War Room under the Pentagon in Dr. Strangelove, the interior of Fort Knox in Goldfinger - all sorts of interiors which, as members of the public, we are never going to get to see, but he created an image of them that was more real than real itself. Adam designed seven James Bond films; Dr. No (1962), Goldfinger (1964), Thunderball (1965), You Only Live Twice (1967), Diamonds Are Forever (1971), The Spy Who Loved Me (1977) and Moonraker (1979). Dr. No (1962) introduced Sean Connery as Bond and the production design as ‘heightened sense of reality’ which would shape the look of the Bond film for the next decade. After we encounter Dr. No – his voice anyway – on the island of Crab Key, I adopted a slightly tongue-in-cheek, slightly ahead-of-contemporary approach: the mixture of antique and modern in his underground apartment, with the Goya Wellington portrait propped on the couch and a magnified aquarium in the stone wall. ABOVE: (left) Sir Ken Adam at the Exhibition "Bigger than life", Munich 2015 [Photo: Robert Haas] (top right) Adam himself painted the copy of Goya's portrait of the Duke of Wellington (which had recently been stolen from the National Gallery) seen in Dr. No's apartment. 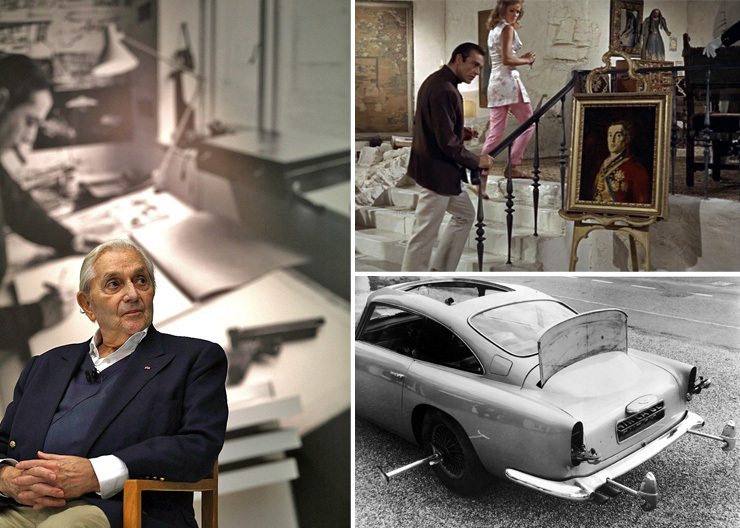 (bottom right) Adam also contributed to the redesign of James Bond's Aston Martin DB5 with intricate technical drawings of the car which was ultimately modified for use in Goldfinger (1964) by special effects supervisor John Stears and his team. Adam was central to the success of the Bond films and designed not only the sets but many of the vehicles and gadgets, now synonymous with the Bond franchise. For Bond’s car, the Aston Martin DB5, Adam created the ‘extras’ such as the reinforced bumpers, a gun in a hidden compartment and one of the most famous Bond moments – the ejector seat. One of Adam’s most memorable set-pieces was for Goldfinger (1964) - the interior of Fort-Knox in the United States. I’d seen the interiors of the gold vaults at the Bank of England, and found them most uninteresting – a series of low tunnels really. So I decided to use stylisation. And I had quite a battle about whether it was over the top. I wanted to build a cathedral of gold, almost forty foot high – completely impractical: gold is too heavy for that. But it worked. 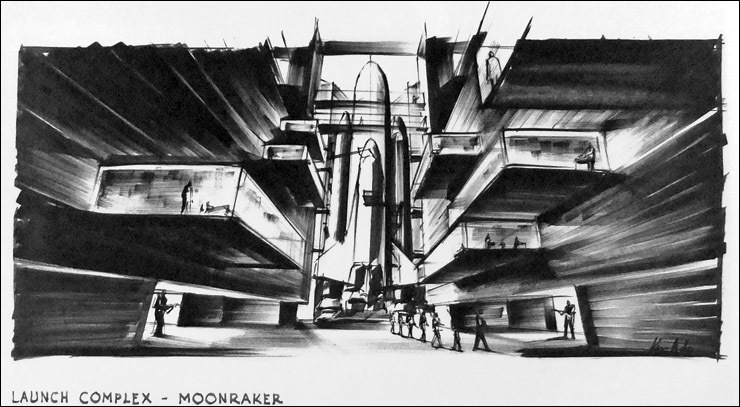 Adam’s final film for the Bond franchise was Moonraker (1979). For research into the space shuttle, Adam spent time at NASA with scientists developing the shuttle programme. Hugo Drax has this hidden launch complex for the Moonraker rockets concealed behind the Iguaçu waterfalls on the Brazil-Argentine border. There was a control room in the shape of a pyramid with an adjoining Great Hall in the Mayan style. I partly based this on Mayan art – in a contemporary setting. The V&A Museum will celebrate Adam’s extraordinary contribution to the art of production design on Saturday 9 September. Speakers include Christopher Frayling, Ian Christie, Jane Barnwell and Matthew Sweet. Film director Nicholas Hynter will recall working with Adam on the film version of The Madness of King George (1994) for which Adam won his second Oscar (the first was for Kubrick’s Barry Lyndon in 1975).